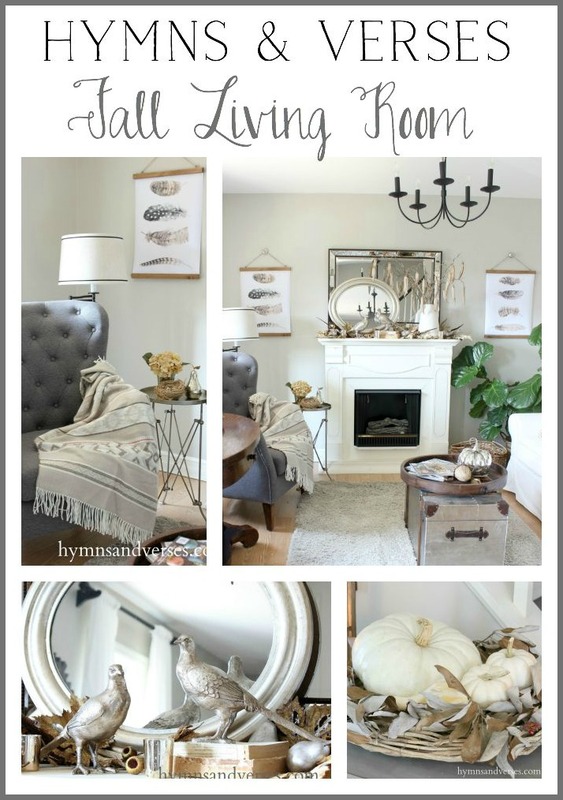 Welcome to my cottage style Fall Home Tour. First, I want to thank the fabulous Marty of A Stroll Thru Life for hosting this week long tour of blogger’s fall homes! 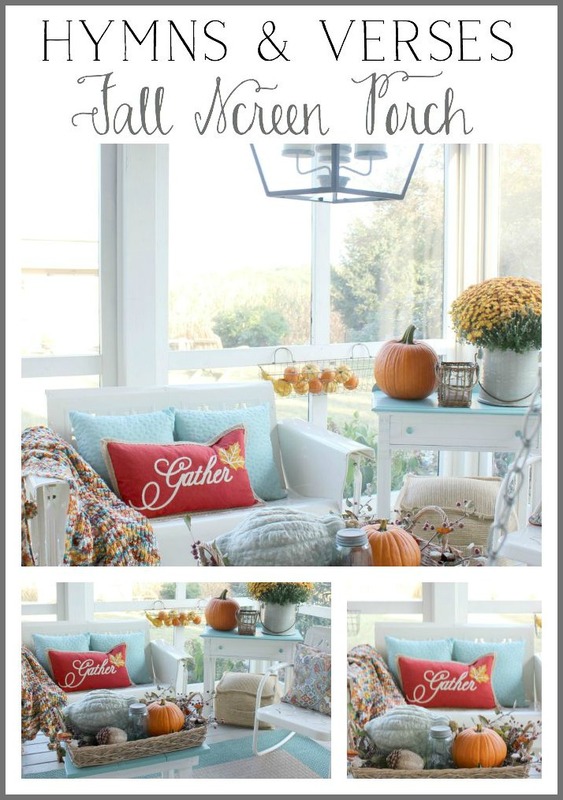 You can find the complete Fall home tour schedule for the week at the end of this post. If you are visiting from Making Home Base, thanks for stopping by! Wasn’t Chelsea’s home gorgeous! 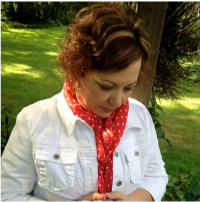 If you are new here, my name is Doreen and fall is my favorite season! To me Fall = Cozy! Let’s begin my fall home tour in the living room because that’s where you enter our home. I kept my fall decor fairly neutral this year. 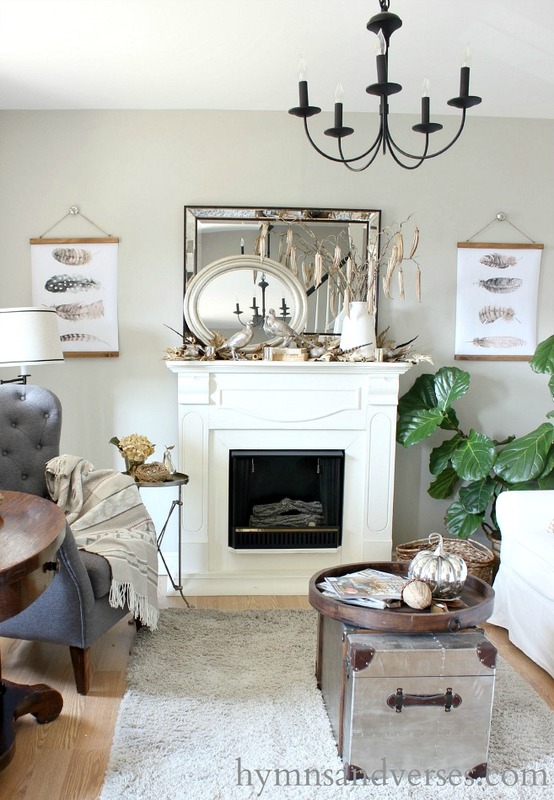 My fall mantel features an oval mirror layered over a larger mirror that hangs above the mantel. I filled a white vase with branches of dried okra seed pods. 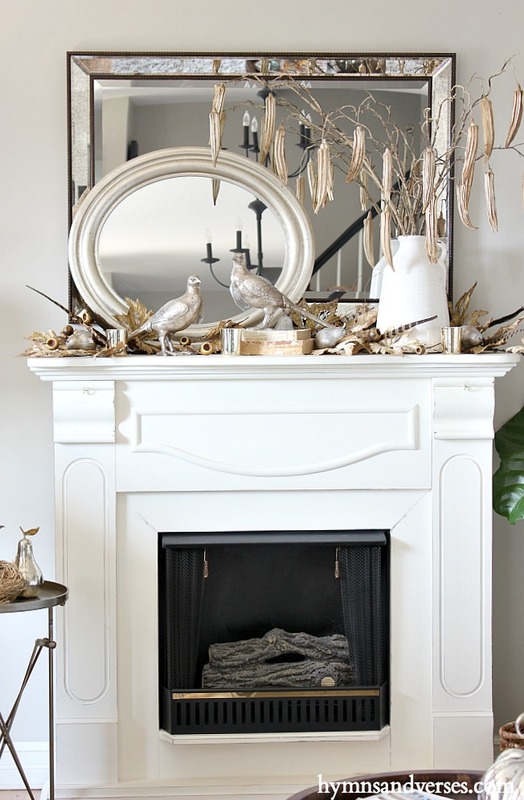 There are faux leaves, faux pears I spray painted silver, a few mercury glass votives, and pheasant feathers scattered along the top of the mantel. And, my favorite fall pheasant statues finish out the vignette. I placed one of the figures on top of two old books to give it more height. The watercolor feather wall charts are a DIY project that I shared HERE. 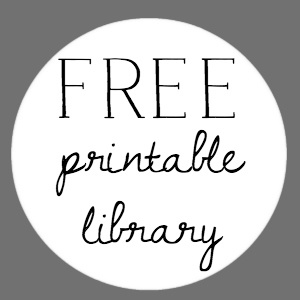 The watercolor feather prints are part of my FREE Printable Library for my email subscribers. I kept the pillows on my sofa neutral with a pair of grid patterned pillows and this bird accent pillow. Sadie was in the mood to pose today! I found some amazing white heirloom pumpkins this year. And created a vignette by sitting them inside a grapevine wreath and then added some tree branches to the wreath. Look at this image carefully. Did you notice that my wood lanterns don’t match? I absolutely could not believe that I didn’t notice this until I was editing my photos!!! Now, let’s move into the dining room. 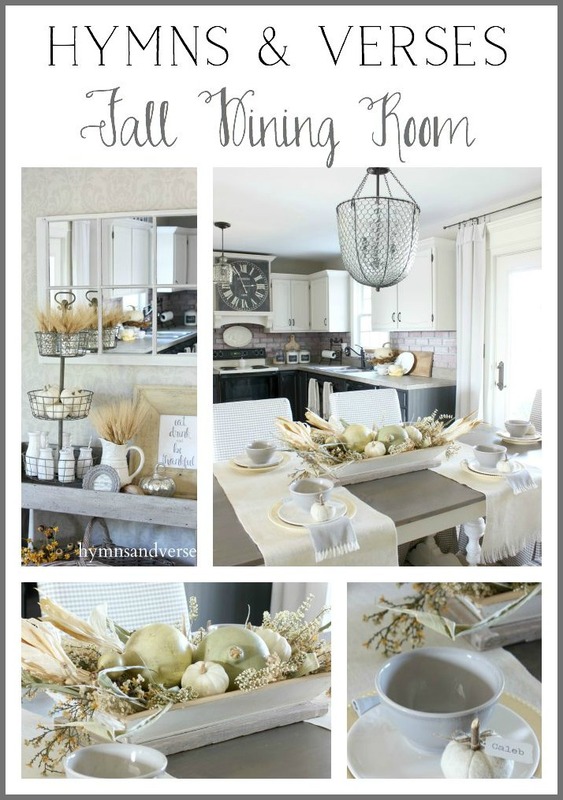 I continued the neutral fall decor in this space with soft shades of yellow, ivory, and gray. 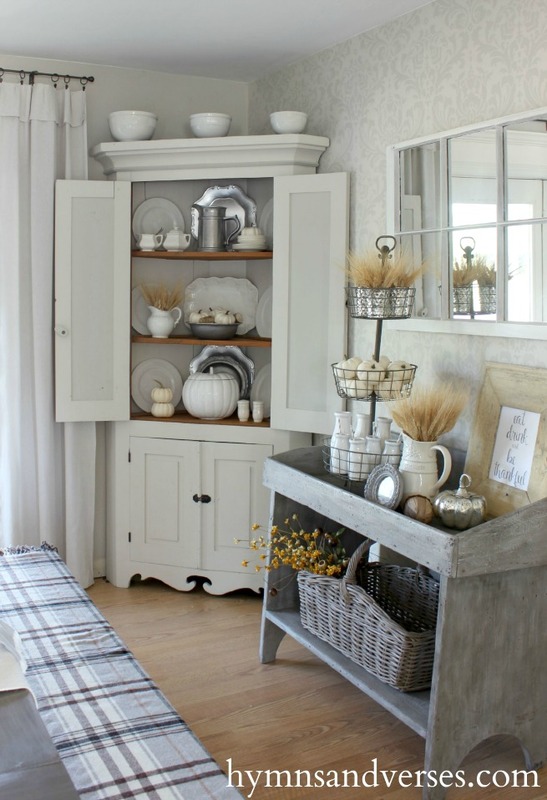 Here’s a look at my antique bucket bench and corner cupboard styled with white pumpkins, wheat, and what ironstone mixed with newer pieces. I also brought out some of my vintage pewter and mercury glass. My tablescape is pretty, but not fancy; with two burlap table runners instead of a tablecloth. 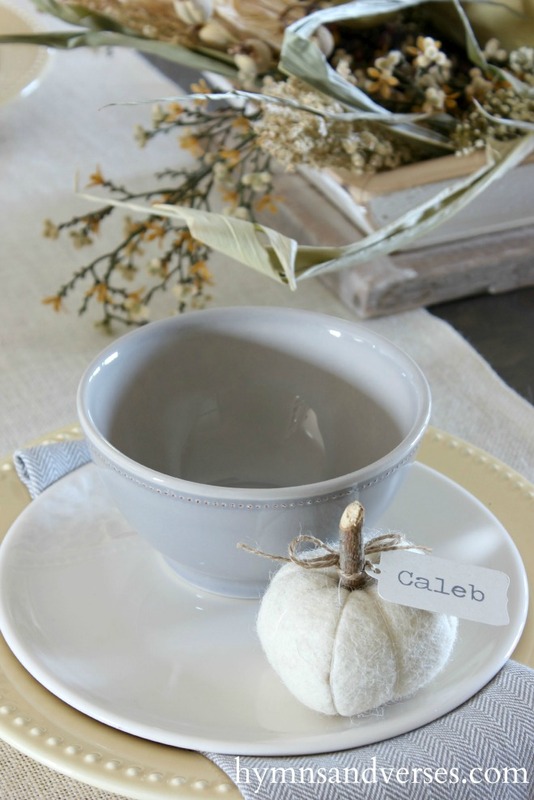 I used my pale yellow Pottery Barn Emma dinner plates, an off white salad plate, a gray soup bowl and gray tweed napkins for each place setting. The centerpiece of faux pumpkins and gourds in a primitive wood bowl and then added some seed pods, branches, corn stalks, leaves, etc. The place cards are small felted wool pumpkins and you can read more about them HERE. Now, let’s head out to the screen porch. Here on the porch is where I brought in some color with traditional orange and rust shades mixed with aqua. 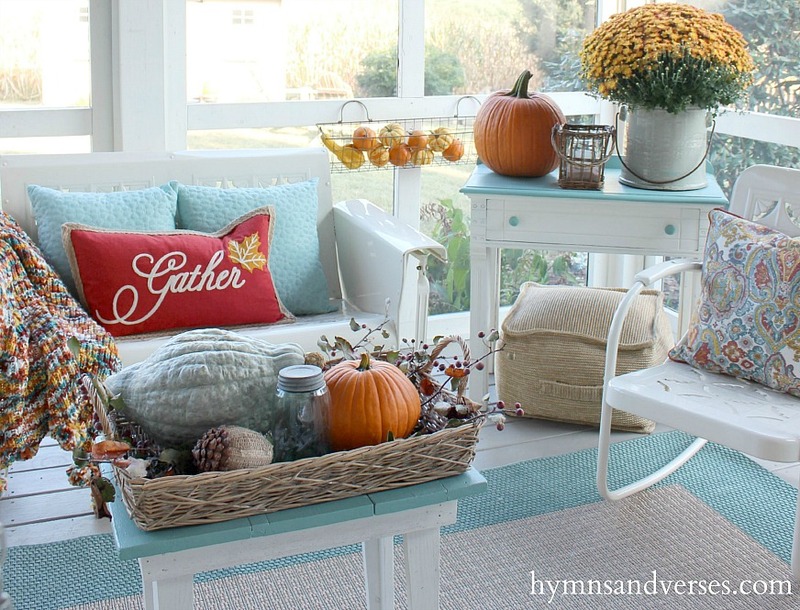 Most of my summer porch decor featured aqua, so I just brought in some fall accents to complete the look. The most obvious are the orange pumpkins! I also found some bittersweet and other berries and the golden mum at a local farm stand. I found the pretty “gather” lumbar pillow, the multicolored throw, and paisley patterned pillows at HomeGoods! And, the blue ball jar and that amazing Hubbard squash fit right in too! Thanks for stopping by to see my Fall Home Tour! If you’d like to see more fall decor, DIY projects, recipes and more – click the image below! 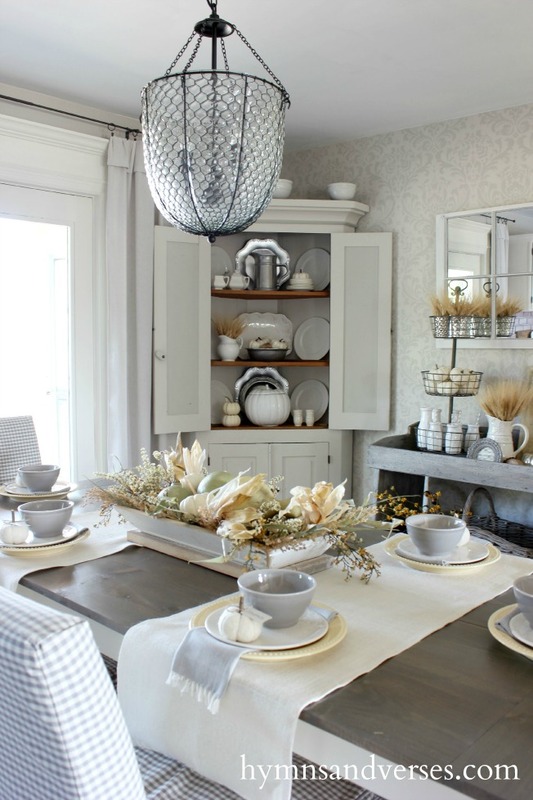 I love how you use neutrals and texture to create the most amazing and inviting spaces. Gorgeous. Such a beautifu tour full of inspiration. i love the neutrals and the pop of colors in the sunroom. that chunky throw looks so comfy, and i love the mantel in your living room. perfect. I'm not quite sure who the Donna is that you mention in your post, but Laura from Decor To Adore loves every inch of your charming home. 🙂 I've truly FALLEN in love. The pods on your mantle almost look sculptural. Just beautiful. Your dining room was my favorite room. The neutral colors are so soothing. Thanks for sharing your lovely home. Thanks for sharing your lovely home. I'm loving all the inspiration. So beautiful!!! 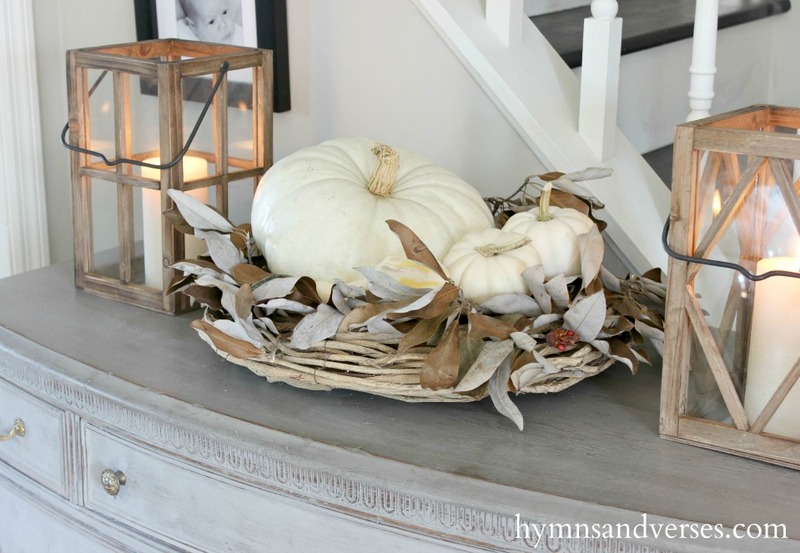 I love the wreath with the pumpkins and dried leaves on your entry dresser and the centerpiece on your kitchen table. 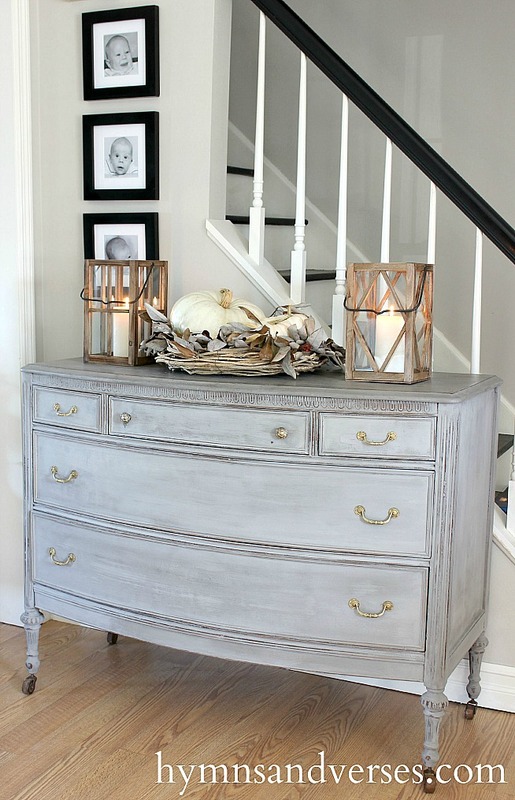 I find it difficult to decorate in neutrals this time of year, but you have mastered it beautifully. 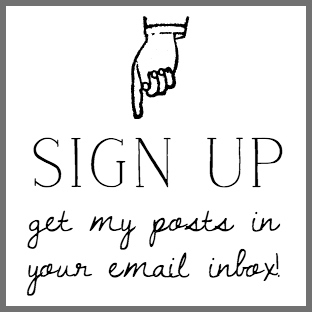 Will definitely be using your ideas in my own home this fall – thanks for sharing – I just REALLY LOVE IT ALL!!!!! Everything is just gorgeous, Doreen. Love it all! Beautiful! I love every detail. I could gaze for hours and never tire of the splendor of your soft Autumnal hues!!! Thank you for inviting me into your lovely home for the 2015 Fall Homes Tours!!! So pretty! Loving all the soft colours and textures, and then the pop of colour on the screen porch! Lovely! Thanks for sharing a tour. So beautiful. Love it all just gorgeous. I really enjoyed my tour of your fall décor. As someone who loves the rich bold colours of fall, I was thoroughly intrigued and amazed at how enamoured I was with the neutral take you created. And to see your screened porch, I can see you definitely know how to do both version well. Fantastic! Your home looks so beautiful decorated for fall. I really like your sunporch. Gorgeous as always! I really like the birds on the mantel. Do you know where you got them by chance? Absolutely stunning fall tour!!! Love your style and decor. What a wonderful tour! 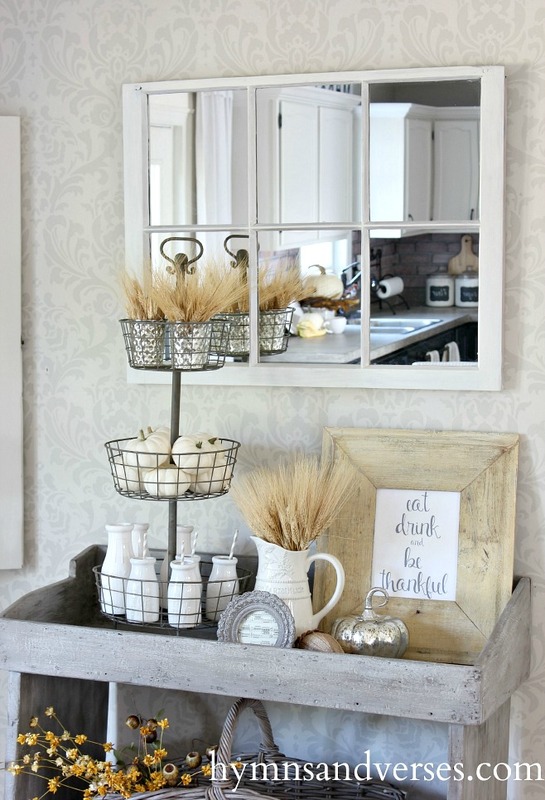 Your mantel is fantastic and I love how you decorate your tables – gorgeous! Truly impressed by your home. Love the tight color palette. Is that okra on the tree limbs on your mantel??? Genius!! Beautiful tour! I love how you use neutrals and texture to create the most amazing and inviting spaces. Thanks for inspiring! So beautiful! So much to look at and get ideas! And just as nice in person too! Thanks for being an inspiration to me! Wow! Your home is beautiful! 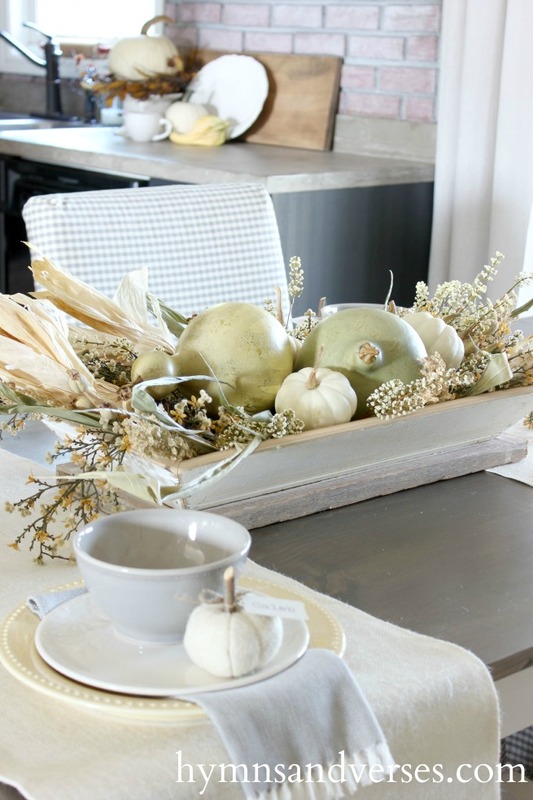 I love how you decorate for fall with "non-traditional" fall colors/neutrals such as the white pumpkins. 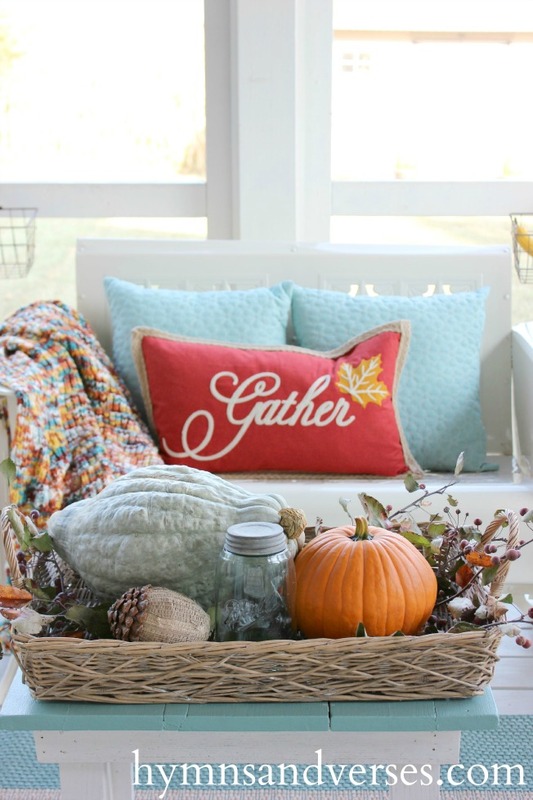 I typically don't like Fall decor because of the colors, but I might have to re-think it after seeing your home tour! Thanks for the inspiration! What a beautiful tour, Doreen! I love it ALL!! :) The colors and textures are just perfect and make it so cozy and comfy!! Thank you for sharing! Your home is just gorgeous, Doreen! I cannot get enough of your beautiful porch, I love the pillow and the throw blanket in there. So many details throughout your home, I love it all! Fabulous Doreen! I love that gather pillow. That was just one of many things that jumped out at me. Your home is totally ready for the season. It looks beautiful. Enjoy! It's all magazine worthy! 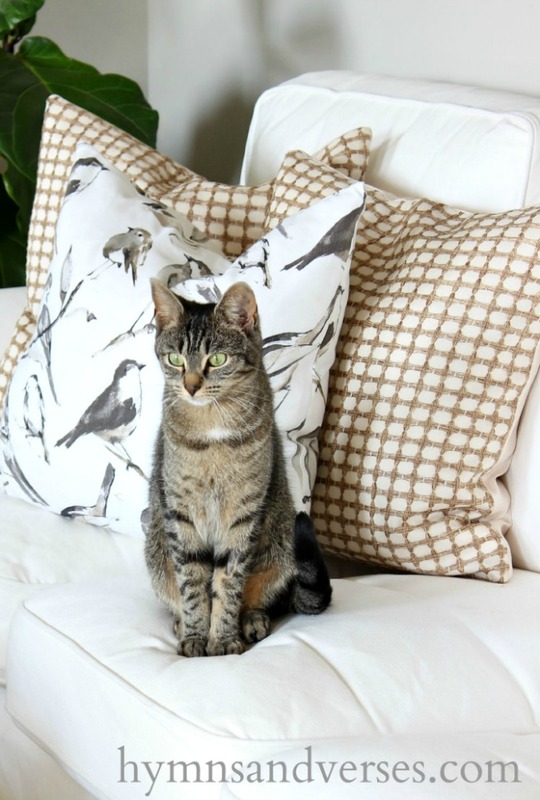 love the sweet kitty next to your wonderful bird pillow! Neutrals done so well! Love that screened porch! Happy to be on the tour with you! This is all SO beautifully done! Love all of the details, thanks for sharing! I am curious, where did you happen to find your grey pincushion chair? I'm on the look out for some myself. Wow what a beautiful home tour Doreen! Your use of fall's subtle colors with the beautiful textures of autumn is simply stunning. And I love love love your screened in porch and that gorgeous light fixture! A great spot to enjoy these early fall days and evenings.